Screens are playing a big part in the lives of many boys I know. I actually feel kids can learn a lot online and don’t mind my son playing around with or working on the computer. I also think balance is one of the most important things when talking about boys and technology. Finding some compelling outdoor and survival activities for boys to do provides a fun way to get outside and learn some practical life skills. 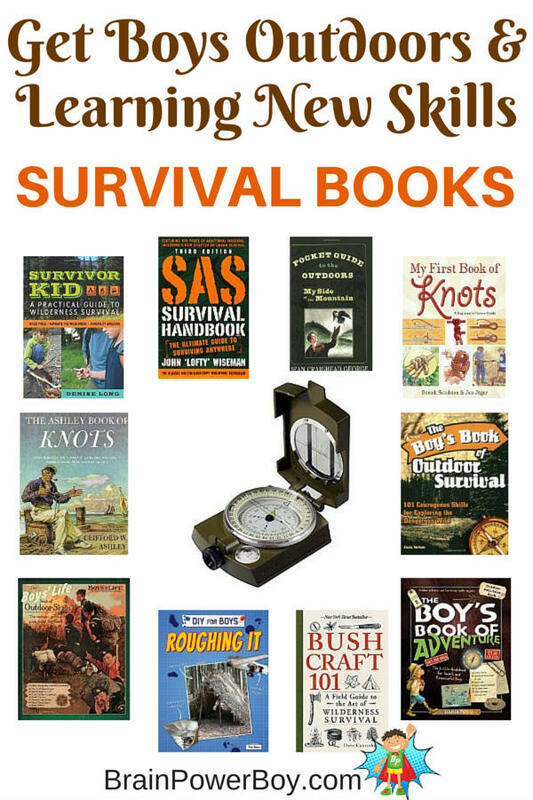 These survival books will provide all the information you (and they) need. That brings us to today’s best books for boys list. These books will get boys learning all kinds of exciting things. We found some really wonderful books that are all about the outdoors, survival and exploration. This post may contain affiliate links which means I may receive a small commission, at no cost to you, if you make a purchase through a link. All opinions are my own and I share things I think would be of interest to boys. Let’s get those boys learning about survival techniques, spending some time exploring (even it if is only in their own backyard,) and finding out about practical skills that will serve them their whole lives. Survivor Kid: A Practical Guide to Wilderness Survival is a winner. It is very thorough and written with kids in mind. It covers building many different types of shelters, building a fire, finding water, signaling for help and much more. Recommended. Is you boy ready to explore the great outdoors? This book will help with the details. The Boy’s Book of Adventure: The Little Guidebook for Smart and Resourceful Boys covers everything from rocks to maps and includes activities to do and crafts to make. If your son has read My Side of the Mountain and liked it, have we got a book for you: Pocket Guide to the Outdoors . It is almost like a real-life companion guide to what Sam learns while on the mountain. If he has not yet read My Side of the Mountain, see if he would like to give it a try! Learn to spot poisonous plants and snakes, escape a bear attack, track wild animals, stitch a wound and some basics as well with The Boy’s Book of Outdoor Survival: 101 Courageous Skills for Exploring the Dangerous Wild . If you have a boy who doesn’t really like to read, but would enjoy doing a few projects, try Roughing It. There are 6 projects including making a mini fridge, a forest shelter and a pocket sized survival kit. Some basics. Short and to the point. You definitely need to learn to tie knots it you are going to be working on these projects. The books above have a few knots in them, but if your boy really gets into knot tying, as some boys do, here are two great books to buy. First is a wonderful starter book for knots with plenty of pictures and good instruction My First Book of Knots: A Beginners Picture Guide . The second is *the* knot book, The Ashley Book of Knots . I would only get the second as an addition to your library or if your boy is really into knots. It is great, but very detailed, expensive, and a bit overwhelming for a beginner as it has almost 4000 knots! Scouts will love it, but you certainly don’t have to be a scout to enjoy Boys’ Life Book of Outdoor Skills . This is a neat and interesting book. It has some basic outdoor survival info as well as survival stories, first aid and other things such as axemanship. Old reproductions from Boys’ Life magazine adds to the charm. Not a children’s book, Bushcraft 101: A Field Guide to the Art of Wilderness Survival is more in-depth than some of the books on this list. For older boys and those who have already checked out the other options. Another solid book that is not written for children is this book from a former SAS (Special Air Service) instructor. This book is a great bargain and a serious guide. SAS Survival Handbook: The Ultimate Guide to Surviving Anywhere is a handbook for survival in any circumstance. If a boy learned everything in this book they would be well prepared and have quite an education to draw on–not only for survival but for so much more. Make sure to get the updated edition. Survival is big in games like Minecraft and taking that outside into the real world is something that I am encouraging my son to do. Hands-on learning is my favorite and we also love to read. These books have so many awesome ways to learn about everything in the great outdoors. Our best cookbooks for boys has some outdoor cookbooks that you and your boys might enjoy as well. If you have younger boys and just want to get them outside a bit see our review on The Kids Outdoor Adventure Book. It has a lot of fun things to do in nature. Or try these activities for boys of all ages. Oh yay! Books to help us get out and explore the great outdoors – we need a reminder of that I think. Adding these to my Amazon wish list so I remember about them when I need to buy boy gifts! Thanks Clare! I really like these for learning new skills and getting kids outside too. This is a great collaboration! I’m going to pin this so we can go through this later, together, with my little “WoodsBoy”. He’s going to love it! Thanks for joining the Laugh & Learn Linkup. Hope to see you next week! So glad you and your adventurer are going to have a look at it. I hope you find a lot of fun things to do. I need to pin this & refer back to it when my son is a bit older. Thanks for linking up this helpful resource up at the Thoughtful Spot! Thank you for the pin!